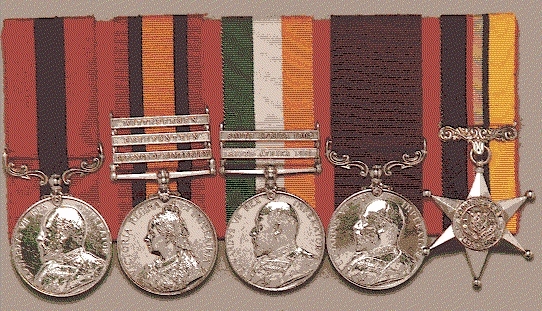 The Medals of Company Sergeant Major George Clark DCM R.E. The Royal Engineers claim descent from William the Conqueror's Military Engineers who were directed in 1066 by Humphrey de Tilleaul. He is depicted in the Bayeaux Tapestry supervising the construction of a fort, transported by sea from Normandy in pre-fabricated sections. The word 'Engineer' derives from the Old French word 'engigneor' meaning one who designs and constructs military engines or works. The medieval records often use the word 'ingeniator' to describe the engineers who were not only skilled builders but also served on the king's campaigns for siege engine duties. The Normans used a 'shock and awe' strategy to subjugate the native peoples of Britain. 'Shock' in the ferocity of their troops and 'awe' in the pomp of their lieutenants and in the edifices erected by their engineers. The White Tower (1078), now part of the Tower of London, was designed by a King's Engineer, Gundulf, a monk who became Bishop of Rochester. By the reign of Richard I (1189-99) the King's Engineers were reputed to be among the finest castle builders in Christendom thanks to their innovative designs and craftsmanship. They introduced the system of barriers to form a coherent defence system. In medieval times of war King’s Engineers were responsible for designing and organising the building of siege engines such as belfries (wooden movable siege towers), catapults (engines worked by a lever and rope to discharge darts, stones etc.) and trebuchets (engines for casting heavy missiles using a sling). They also directed the building of roads and river crossings. Edward I had a bridge of boats built to cross the Menai Straits between North Wales and Anglesey. Engineers also dug mines to undermine the foundations of the walls of besieged castles. The import of gunpowder to Europe from China in the 14th century brought about a radical innovation in warfare, the cannon, and a re-appraisal of fortification design. In 1405, a new department called the Office of Ordnance, with its headquarters and main arsenal in the White Tower at the Tower of London, was established to administer the King's cannon, arsenals and castles, as well as a growing armament industry springing up in London. The Office of Ordnance employed engineers and artillery officers whose numbers were increased in time of war when ‘Ordnance Trains’ were raised. These Trains consisted local artisans, tradesmen and labourers who were capable of assisting the engineers and gunners in their tasks. The Trains were disbanded at the end of each war and their members resumed their peace-time occupations. The Office of Ordnance, renamed the Board of Ordnance, was abolished in1855. In 1704 the British besieged Gibraltar which they eventually captured from the Spanish. Gibraltar was to later play an important part in the development of the Corps. In the aftermath of the Treaty of Utrecht (1714) that ended the War of Spanish Succession (1701-13) the Trains were again disbanded but Britain found itself in the possession of Gibraltar, Minorca and Nova Scotia. All these territories required extra engineer staff to maintain their defences. At same time it became apparent that the functions of gunnery and engineering were not entirely compatible and that Artillery officers resented being subordinate to Engineers. It was proposed that two distinct Corps be created within the Ordnance: the Royal Regiment of Artillery, responsible for gunnery, and the Corps of Engineers, responsible for military engineering. In 1716 the proposal was implemented by Royal Warrant and the Corps of Engineers was formed and was staffed entirely by officers. A Royal Warrant, dated the 25 April 1787, bestowed the Corps with the 'Royal' title so it became the Corps of Royal Engineers. On 10 July 1832 William IV granted the Royal Regiment of Artillery and the Corps of Royal Engineers permission to wear, on their appointments, the Royal Arms and Supporters, together with a cannon and the mottoes Ubique (Everywhere) above the cannon and Quo Fas et Gloria Ducunt (Where right and glory lead) below it. In 1868 the cannon was omitted from the Corps Badge. 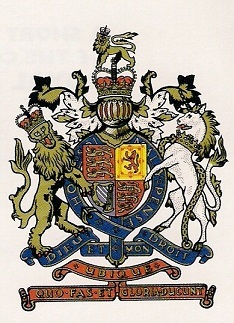 Since then the actual design of the Royal Arms has changed slightly with each reigning monarch. * Portugal - 5th, 6th, 7th and 8th Companies of 2nd Battalion. * Cadiz, Spain - 6th and 7th Companies of 1st Battalion. However, although the members of these companies were expert at constructing static fortifications and other works they had little experience of field (combat) engineering. Their shortcomings became very apparent during the early stages of the Peninsular War wars with France and there were soon calls for improvements. Royal Engineers and Royal Military Artificers accompanied General Sir John Moore's 1808 campaign to Portugal and Spain. Their first major challenge was to build a great defensive system north of Lisbon, which became known as the Lines of Torres Vedras (1809). Over a period of ten months 182 redoubts were constructed mounting more than 600 guns with a manning capacity of some 40,000. The structures stretched over 25 miles from the lower Tagus to the sea. "The engineer officers were zealous; and notwithstanding some defects in the constitution and customs of their corps, tending rather to make regimental than practical scientific officers, many of them were well versed in the theory of their business: yet the ablest trembled at their destitution of all things necessary to real service. Without a corps of sappers and miners, without a private soldier who knew how to carry on an operation under fire, they were compelled to attack fortresses defended by the most warlike, practised, and scientific troops of the age ... 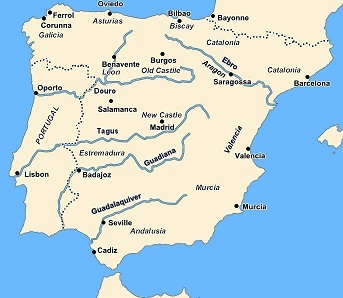 The sieges carried on by the British in Spain were a succession of butcheries, because the commonest materials and means necessary for their art were denied to the engineers"
"I would beg to suggest to your Lordship the expediency of adding to the Engineers' establishment a corps of sappers and miners. It is inconceivable with what disadvantage we undertake any thing like a siege for want of assistance of this description. There is no French corps d'armee which has not a battalion of sappers and a company of miners. But we are obliged to depend for assistance of this description upon the regiments of the line". The Sieges of Badajoz 1811-1812: Three attempts were made to break the French defences at Badajoz before success was finally achieved on the third attempt in April 1812, where 24 Engineers and 115 Royal Military Artificers were employed on siege works. It was these actions and failures at the earlier sieges of Badajoz that prompted Wellington to request "a sufficient trained corps of sappers and miners" and for Napier to write: "It was strange and culpable that the British Government ... should have sent an engineer corps into the field so ill organised and equipped that all the officers' bravery and zeal could not render it efficient". Sir Charles Oman in his history of the war entitled Wellington's Army held the view that the failure of the Badajoz sieges was due to the shortage of sappers and miners and those responsible for that shortcoming were the professional advisers to the administration, who should have drawn attention to the need of such a corps. On 23 April 1812 a Royal Warrant authorised the establishment of the 'Royal Engineer Establishment' in Chatham for "the Instruction of the Corps of Royal Military Artificers, or Sappers and Miners, and the junior officers of the Royal Engineers, in the duties of Sapping and Mining and other Military Field Works"
'The Royal Military Artificers, or Sappers and Miners’ were formed on 4 August 1812. Its title was changed in 1813 to the simpler one of 'Royal Sappers and Miners'. 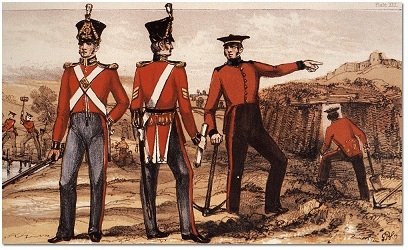 In the same year the colour of their dress was changed from blue to scarlet to render the wearers less conspicuous to the enemy when acting with working parties of the line. The new Corps was commanded by the Royal Engineers and trained as field sappers and miners to replace the system of reliance on infantry of the line for field engineering duties. By the end of the Peninsular War in 1814 there were five companies serving with Wellington's Army. In 1856, the Corps of Royal Sappers and Miners was amalgamated with the Corps of Royal Engineers. The rank of 'Private' in the newly formed Corps of Royal Engineers was changed to 'Sapper' and still exists today. This authorized the formation of a Company of Artificers at Gibraltar with an establishment of 68 all ranks (no officers). Within a year, this was increased to 93 all ranks and in 1776 to 116. 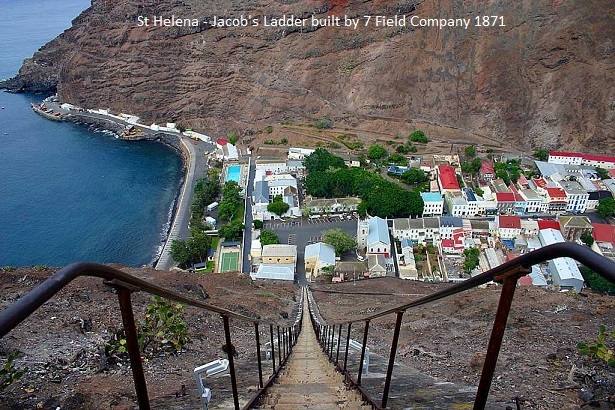 In 1786 its establishment was raised to 275 and was divided into 2 Companies. In 1789 a Colonel-Commandant and Quartermaster were appointed. The new establishment was 12 companies of 126 all ranks for a total of 1,514 including staff. In 1807 the offices of Adjutant and Quartermaster were combined and the headquarters of the corps was established at Woolwich. all ranks for a total of 2,861 all ranks (this must include a staff of 13). The companies were grouped into 4 battalions each of 8 companies. 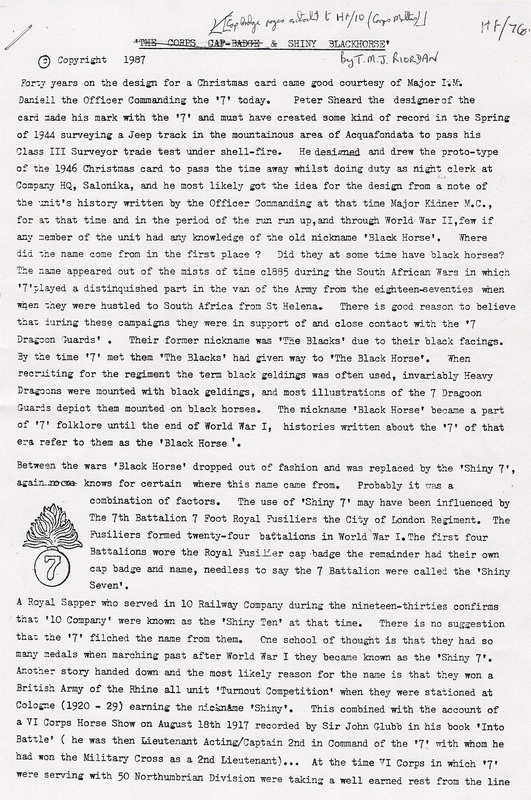 The companies were no longer localised but removed by rotation from station to station as required. This was because of the severe strains on the Corps created by the Peninsular War, which were initially answered by drafts from companies. Expansion was completed by the end of the year. In 1812 a school was set up in Chatham for military fieldwork, since developed into the School of Military Engineering. On 4th August 1812 the Master-General of the Ordnance directed "that the RMA should hereafter be styled the Royal Military Artificers or Sappers and Miners." On 6th March 1813 this was changed to the Royal Sappers and Miners. At the same time the uniforms were changed from blue to scarlet. In 1814 the posts of Adjutant and Quartermaster were split again. The Peninsular War started when Napoleon's Grande Armee invaded Portugal. The British, Portuguese and Spanish eventually drove the French out of Spain after several hard fought battles. 2,655 by adding 20 men to each company. By 9th May 1855 there were 9 RS&M companies in the Crimea. The extra companies were the 1st, 2nd, 3rd, 4th and 5th. Corps of Royal Sappers and Miners to the Corps of Royal Engineers. 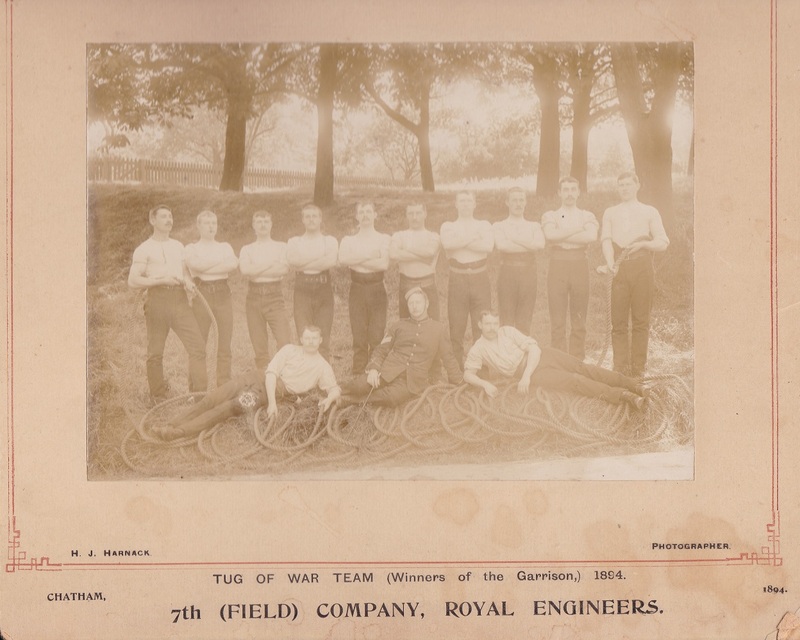 The privates of the RS&M became sappers in the Corps of Royal Engineers. In 1877 the 2nd, 5th, 17th and 31st Field Companies were created, as part of the organisation of the field army into Army Corps. In May 1885 the field companies were increased to 6 (7th, 11th, 12th, 23rd, 24th and 26th). In November 1885 the 17th Company exchanged places with the 11th. In the Army Estimates 1887-88 the 17th, 37th and 38th Companies were converted to field companies. This was to provide the field army with enough field engineers for 2 Army Corps organised into 2 field battalions as follows. 1st Field Battalion, RE (7th, 11th, 17th and 23rd Field Companies, RE) with the 1st Army Corps. 2nd Field Battalion, RE (12th, 26th, 37th and 38th Field Companies, RE) with the 2nd Army Corps. by mid-1899 it became apparent that the clouds of war were gathering in South Africa and 7 Field Company was alerted for deployment to the Cape. On the 14th of July 1899 the 7th Field Company left the Curragh bound for Southampton. The Company strength was 6 officers, 180 non-commissioned officers and men, and 30 horses. 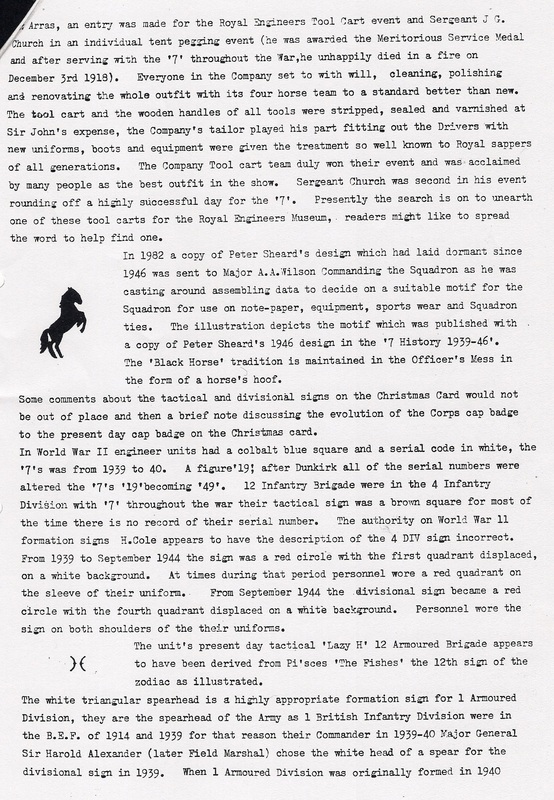 The company was commanded by Brevet Lieutenant Colonel W.F.H.S. Kincaid. On the 11th of December 1899, 7th Field Company was attached to the Brigade of Guards and took part in the right attack during the unsuccessful Battle of Magersfontein. Following this battle, Lord Methuen decided to hold his ground along the Modder River to await further developments with regard to the movements of the Boer forces and other British forces in the area. British offensive operations began again on the 12th of February 1900 with 7 Field Company attached to the newly formed 9th Infantry Division under Lieutenant General Sir H.E. Colville. Following the relief of Kimberley the British force began operations to capture the Boer forces in the laager near Paardeberg Drift which were under the command of General Cronje. Trenches were commenced and pushed forward towards the laager. By the 26th of February the 19th Brigade and 7 Field Company had made a trench nearly 500 yards long on the right bank of the Modder as well as another trench on the left bank of the river. The Boer entrenchments were assaulted that night by the 19th Brigade, of which the Royal Canadian Regiment and a detachment of 7 Field Company formed the vanguard. The men of 7 Field Company got within 100 yards of the Boer trenches without being observed, and then, at about 3 a.m., a heavy fire was opened upon them and the sappers with some of the Canadians succeeded in entrenching themselves close to the enemy's lines. By 5 a.m. the trench was completed and fire was opened at short range on the Boers, who, after defending themselves for a time, made proposals for surrender. The action of 7 Field Company in this battle was highly commended by Lord Roberts, who inspected them the same day and congratulated them on their gallant conduct. 7th Field Company continued the advance on the 6th of March 1900 with the Highland Brigade of the 9th Division. On the 13th of March the British forces entered Bloemfontein. By the beginning of May 1900 Lord Roberts completed his preparations for the invasion of the Transvaal and gave orders for the advance. 7 Field Company marched with the 9th Division on the 3rd of May. The company, which was attached to the Highland Brigade, reached Winburg on the 6th of May and immediately fortified the town for defensive operations. 7 Field Company, commanded by Lieutenant E.E.B. Wilson, was attached. Fighting continued in the northeast of the Orange Free State during June and July of 1900, and the Boers were gradually driven back. The Boers retired to the Brandwater Basin, a mountainous district lying between the Wittebergen and Roodebergen Hills and the Caledon River. 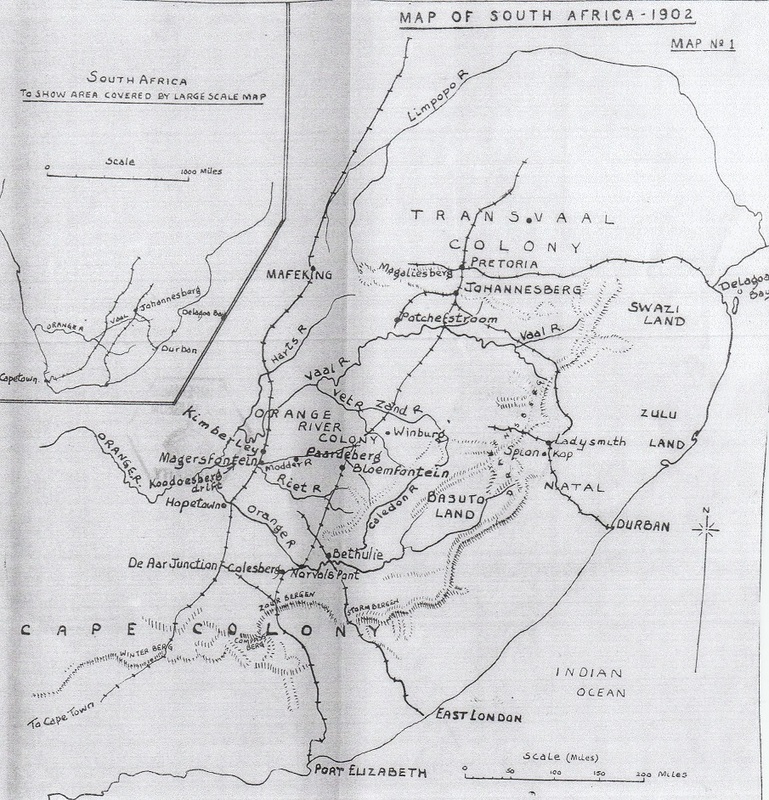 The work of the Royal Engineers during these operations, including 7 Field Company, was to block the mountain passes to prevent the Boer escaping. 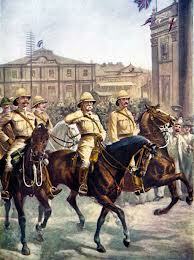 By the 1st of September 1900 the regular campaign in South Africa was over. What followed from this point was a series of small guerrilla type operations for which the Royal Engineer field companies were broken up into small sections and detachments. On the 28th of September 1902 7th Field Company arrived in Aldershot where they were to be stationed. Only 3 officers and 45 other ranks of the original company returned to Aldershot. One officer (Lieutenant Trench) and 12 non-commissioned officers and men had died in South Africa, the remainder being transferred or invalided. The origins of Shiny 7 date back more than 200 years. Since its inception, Shiny 7 has participated in every major campaign/war the British Army has been involved in, and fought many battles along the way. Many military honours have been awarded to its members throughout the different eras, including the Victoria Cross. The courage and valour of our predecessors has to be greatly admired, especially when working in the harsh and unpleasant conditions they had to endure. All those who have served in Shiny 7 can be immensely proud of its untouchable history. It is a pity we were never made aware of the Squadron’s history when we joined it. The Squadron would see benefits, if everyone joining the Squadron were given a copy of its history to read as part of their induction, they would take inspiration from it. He was 25 years old, and a Corporal in the 7th Company Royal Sappers & Miners during the Crimean War when the following deed took place for which he was awarded the VC. 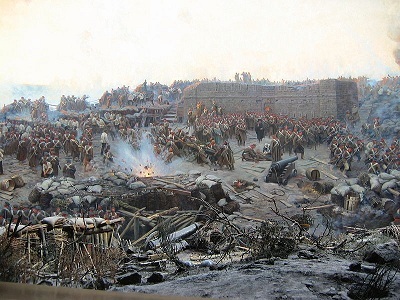 On 14 February 1855 during the Siege of Sevastopol, Crimea, Corporal Lendrim superintended 150 French Chasseurs in building No 9 Battery left attack and replacing the whole of the capsized gabions under a heavy fire. On the 11 April he got on top of a magazine under fire, and extinguished burning sandbags, making good the breach. On 20 April he was one of four volunteers who destroyed the screen which the Russians had erected to conceal their advance rifle-pits. 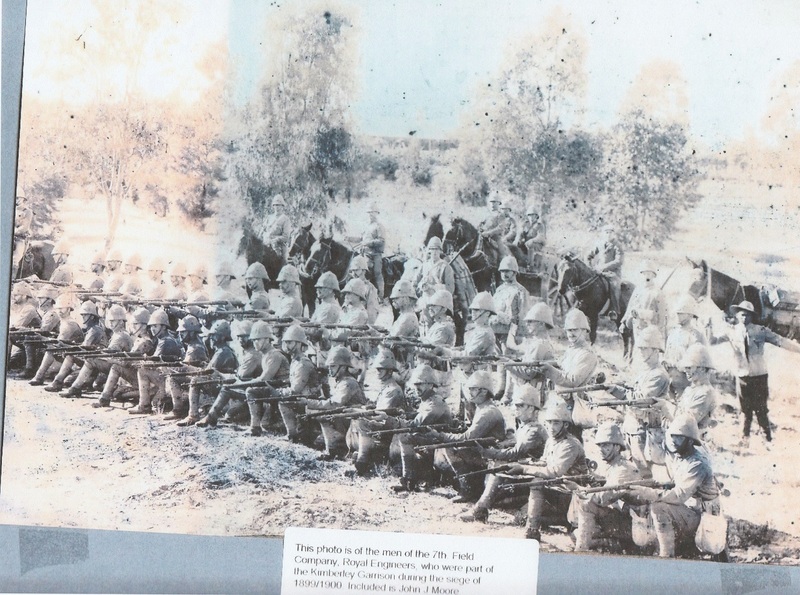 On 21 November 1899 the British 1st Division under Lord Methuen began its advance north from the Orange River to relieve Kimberley. 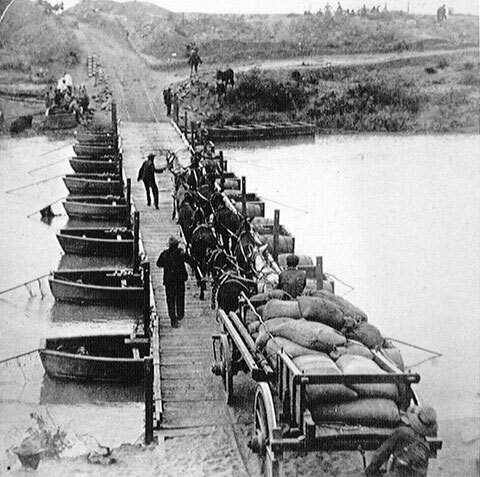 On reaching the Modder River, the 7th and 11th Field Companies, Royal Engineers, constructed a temporary bridge which was completed on 10 December 1899. Sappers embarking for South Africa 1912 (not 7 Coy). This appears to be a RE Tool Cart. 7 Field Company was so first called in 1806 when Companies of Artificers were first numbered, though the Company was probably raised in 1793 for the war in Flanders. The numbers were not, however, much used at this time, the Companies being more usually known by the name of their stations. 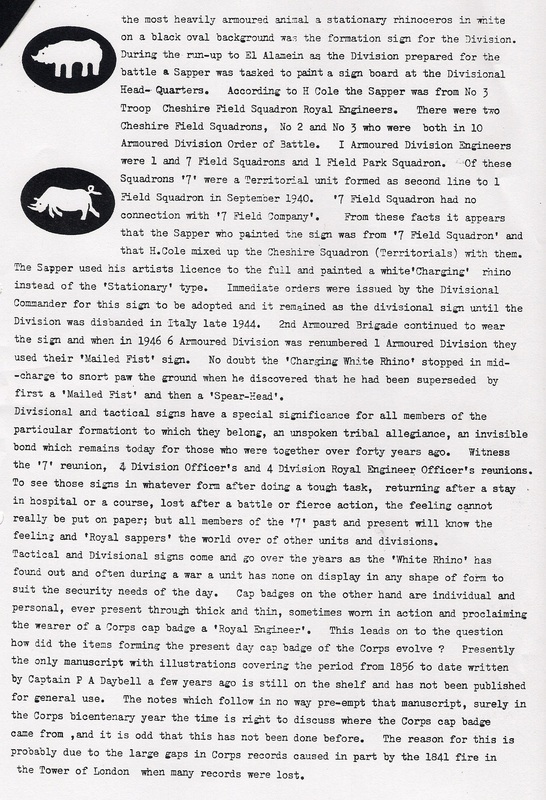 In 1811 the Corps was reorganised into eight Company Battalions and the Company history becomes obscure. 7 Field Company landed in Gallipolli on April 8th 1854, commanded by Captain C.J.Gibb RE and was for some time employed on landing piers, log huts for hospitals, stables etc at base port. On the 7th of December the Company moved to Sevastopol, its strength being 3 officers and 86 men. The Company brought 400 gabions and large numbers of sandbags, which were very welcome at the siege, where revetting materials had hitherto been very short, the sappers having to use stones for the purpose. In January 1855 very severe frosts set in and this was most detrimental to the work as the troops brought to the trenches coffee, which for some unaccountable reason had been sent unroasted and other articles that required cooking. For this purpose they made use of brushwood from gabions and fascines and anything in the way of fuel they could lay their hands on, even pick elves becoming scarce. In fact the diary of the siege shows that the sappers had to labour under great difficulties, but nevertheless carried on with their customary zeal and cheerfulness. At this time a section, or more accurately a squad, was termed a brigade and consisted of 1 NCO and 8 men. The doing of he doings of the Company in the siege are too varied and too intricate to relate, but the sappers were mainly acting as overseers to infantry and Turkish labour, doing the actual skilled work of laying gabions, sandbags themselves. Cpl William. J. Lendrim VC for intrepidity getting on top of a magazine and extingquishing sand bags which were burning and making good the breach under fire, April 11th 1885. For courage and praiseworthy example in superintending 150 French Chasseurs on 14th February 1885, in building No 9 battery left attack and replacing the whole of the capsized gabions under heavy fire. Was one of the four volunteers for destroying the furthest rifle pit on April 20th . Spr William Bruce and Spr Neil McInnis. And strongly recommended for reward but without result. Corporal William James Lendrim (1 January 1830 – 28 November 1891) rose to Serjeant-Major William James Lendrim, V.C. Corporal Lendrim was the first non-Officer Royal Engineer soldier (at that time he would have been a corporal in the Royal Sappers and Miners) to be awarded the V.C. He was awarded it for several acts of bravery in the trenches around Sebastopol. On the 14th of February 1855, Lendrim was leading a party of 150 French Chasseurs. They were engaged in building No. 9 Battery ‘left attack,’ an eight gun battery, situated close to a chosen advance point. The battery was protected by large gabions that were being repeatedly attacked and may of the gabions were capsized. Repairing the damage to the gabions, under fire, was very dangerous. Lendrim accepted this undertaking - leading his men under fire from gabion to gabion, ensuring all were repaired. The officer in charge was in no doubt that Lendrim's actions had saved the battery. On the 11th April a 21 gun battery was under heavy attack from Russian artillery, resulting in a large number of casualties. A live shell hit the magazine roof, setting on fire sandbags that were very close to a 68 pounder gun. Lendrim immediately volunteered to extinguish the fire, leapt on to the roof, under fire, removed the burning sandbags and made good the breach. On the 20th April, Corporal Lendrim was one of four volunteers that charged a Russian rifle pit directly, quickly clearing it and destroying the screen which the Russians had erected to conceal their advance rifle-pits, before occupying the rifle-pit. This was done in efforts to consolidate British and French gains of the 'right attack' and became the third action that contributed to his V.C. He was born Carrick-on-Shannon, County Leitrim, Ireland on the 1st January 1830. He joined the Royal Sappers and Miners in 1847. 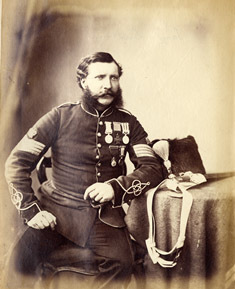 He also served in the Indian Mutiny, and later achieved the rank of Sergeant-Major, and worked at the Staff College, Frimley, serving until 1871. He married Louisa and had 11 children - all alive in 1881. He was initiated in Lodge of the Thirty-seventh Company of Royal Engineers, No. 963 on 8 July 1863 and passed on 12 August the same year. As the Lodge warrant was withdrawn on 22 February 1864, he was raised in United Chatham Lodge of Benevolence, No. 184, Chatham on 12 April 1864, resigning in November the same year. He was the first Junior Warden of the Albert Edward Lodge No. 1714 chartered by the United Grand Lodge of England in the Province of Surrey in 1877, and its third Worshipful Master in 1879. He was appointed to Provincial Grand Steward in the Province of Surrey in 1878, and Provincial Grand Pursuivant of Surrey in 1881. William died Camberley, Surrey, on the 28th November 1891 and is buried at the Royal Military Academy Cemetery, plot 182. William also received the Légion d'honneur and Médaille militaire of France. His Victoria Cross and other awards are displayed at the Royal Engineers Museum. The annexation of the Transvaal in 1878 lead to the disastrous war in 1879. The 7TH Field Company was in South Africa at the time, under the command of Major F.W.Nixon RE, who had with him Lieutenants F.H. MacDowel, and J. Clarke. The Company appears to have been much split up at this time and it is difficult to trace the movements of different detachments. In the disastrous affair at Isandlwana where 52 officers and 806 men lost their lives, Lt MacDowell was killed and also four sappers - the whole of the RE with the column. In this action 16 officers and 400 men out of 16 officers and 403 men of the 1st Battalion, the 24 Regiment and the whole Company of the 2nd Battalion present was killed. At Fort Kambula Sgt Wood and 10 sappers of the 7th Company was present. At Fort Ulundi, Sgt Wood and 6 sappers fought in the square during the battle, Sgt Wood being wounded. In the battle which ended the war, some 1,900 white officers and men and 540 natives was attacked by 20,000 Zulus, of whom only about half got close enough to take part. It was however, a fine example of British Square fighting and the Company should feel proud to have taken part of it. In grateful memory of Sergeant-Major William James Lendrim VC, whom as a Corporal serving with the 7th Company Royal Sappers and Miners in the Crimean War, was awarded the Victoria Cross for gallantry on 14 February 1855. 160th Anniversary 14/02/1855 - 14/02/2015. Photo below kindly supplied by Mr Martin Moore who is currently researching 7 Field Company prior to and during the Boer war. 7 Field Company were based in Ireland prior to the Boer war.